replaced with a software mixer producing less that favourable results. Risen3D is effected because it uses DirectSound3D and EAX which is no longer supported in Vista. game. If you don't have one of these sound cards then 2D sound will still be available in Vista. 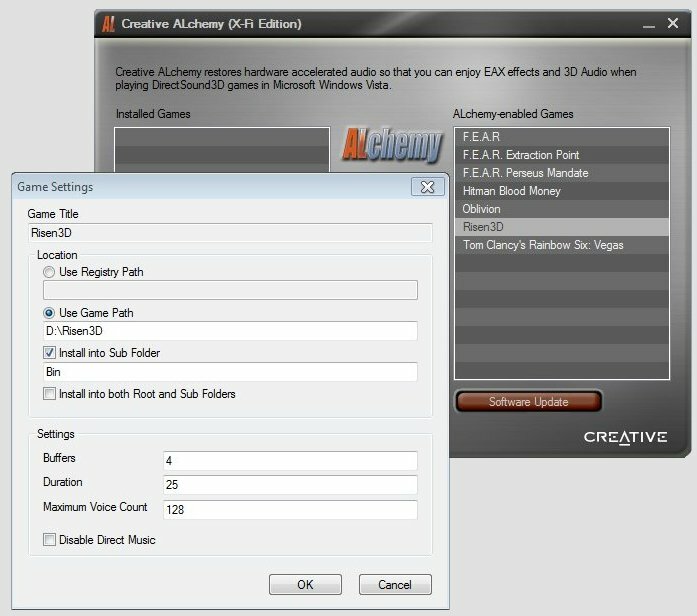 If you have either a Creative X-FI or Audigy sound card - download ALchemy from Creative's website then install the program. ( dsound.dll, dsound.ini ) into your Risen3D\Bin folder - the illustration below assumes you have Risen3D installed in D:\Risen3D. Note1: The following only applies for Windows post XP, other Window's platforms utilise DirectSound 3D hardware acceleration. Note2: Adjust the reverb of your X-FI in either the control panel or Creative's console as the default value is far to high. Make sure the 3DSound option is enabled in the launcher for the above to work. You need to download the correct Alchemy software for your particular Windows platform from the Creative site.